Lung-related illness in the pediatric population is a very common presentation. There are many different causes of lung pathology in the pediatric population. Categories of pathology can include: genetic, congenital, acute, and infective. This article will focus on atopy, acute and infective pediatric respiratory disease. As with pediatrics in general, you should review the normal vitals by age group and be readily familiar with them. It is important to always remember that pediatric medications may be the same as for adults but that the dosing depends more upon weight. 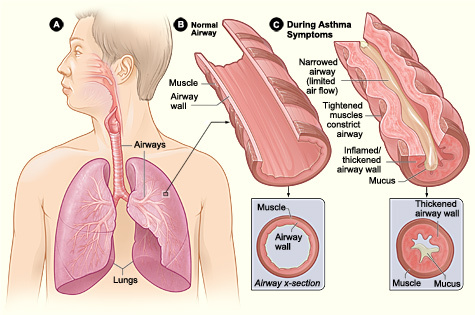 Asthma is an inflammatory airway disease that leads to bronchial luminal narrowing and thus obstruction of airflow. It can occur at any age but 75% of patients will be diagnosed before the age of 7. It is characterized by cough, wheezes and dyspnea. Asthma episodes occur intermittently and are usually in response to a stimuli or triggers such as pollen, mold, cold air, or in response to exercise. These stimuli result in bronchospasm with edema and the formation of mucus plugs. In severe cases, a tachypneic patient will result in metabolic acidosis. In untreated disease, the airway will remodel and cause smooth muscle to undergo hypertrophy and hyperplasia. The hygiene hypothesis has gained significant support as the cause of asthma and atopy in general. The theory is based upon the thought that there is an imbalance between T- helper (TH) TH1 and TH2 cells. TH1 cells are for cell defense and release IL-2 and IFN-ɑ. TH2 cells are responsible for allergic inflammation and IgE stimulation through IL-4, IL-5, IL-6, IL-9 and IL-13. At birth, infants have a higher number of TH2 cells and a low number of TH1. 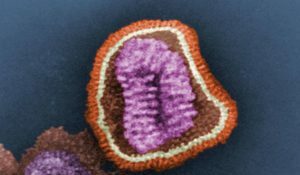 It is through exposure to viruses and other infectious causes that TH1 cell numbers increase and result in a more even balance between TH1 and TH2 cells. In the hygiene hypothesis, there is a lack of exposure to viral particles, which results in a larger ratio towards TH2 cells. The TH2 cells then respond to benign stimuli such as pet dander that is around the home. Diagnosis can be made clinically, but usually requires spirometry to confirm. Asthma is an obstructive airway disease so less air is forced out of the lungs which results in a reduced FEV1 to FVC ratio. It can further be diagnosed with a bronchodilator, which would reduce the bronchospasms to result in a return to their baseline FEV1/FVC ratio. Acute management of asthma (status asthmaticus) focuses on oxygen administration with beta 2 agonists to cause bronchodilation. Steroids are often given early in order to aid in the reduction of the immune response. Long-term management revolves heavily on patient education about avoiding triggers and to have regular assessments. The proper use of bronchodilators and good medical compliance are needed in order for proper treatment. Beta 2 agonists can be long or short acting. Salmeterol for longer term and salbutamol for short acting. Act on beta 2 adrenergic receptors that result in smooth muscle relaxation. Ipratropium is a muscarinic antagonist. It blocks acetylcholine from binding to muscarinic receptors resulting in bronchial dilation through muscle relaxation. Anti-leukotrienes work to block inflammatory mediators from causing constriction and inflammation. Drugs have -luk- within the name to designate them. One you should know is montelukast. Steroids can be oral prednisone or IV methylprednisolone for acute exacerbations. Inhaled versions are used for long-term treatment as a second line if beta agonists alone do not treat the symptoms. Steroids work by stabilizing capillary membranes to prevent immune cells from entering tissues. Oral thrush is a common side effect of oral steroids and patients should be educated to rinse their mouth out after use. Pediatric pneumothorax is rare and can be fatal if left untreated. As in adults, a pneumothorax occurs when there is an insult to either the visceral or parietal pleura of the lung. 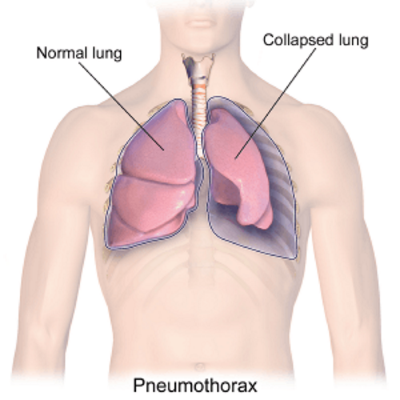 A simple pneumothorax occurs when air can enter the pleural space but does not build up significant pressure. A complex pneumothorax occurs when air can enter the pleural space but cannot leave, building up significant pressure within it. Patients must avoid scuba diving or activities that involve pressure changes if they have ever had a pneumothorax before. Spontaneous pneumothorax usually occurs in older children who are tall and skinny, but it can happen in premature infants on a ventilator. They occur when the visceral pleura ruptures. Rupture usually occurs in areas where there is a pleural bleb. Some patients may appear asymptomatic, while others may complain of dyspnea or chest pain. Traumatic pneumothorax occurs when there is trauma to the chest resulting in damage to either the visceral or parietal pleura. Tension pneumothorax is a severe medical emergency. As the air fills the pleural space, it compresses the lung and results in a shift of the mediastinum displacing the trachea away from the side of lung collapse. If left untreated, it can result in cardiogenic shock and death. Diagnosis can be made clinically and can be confirmed with a chest X-ray. In young infants, transillumination of the chest can be used. Given the severity of a tension pneumothorax, it needs to be treated immediately and treatment can be started based upon clinical diagnosis. Treatment includes oxygen therapy in the case of a small pneumothorax. In cases of trauma, chest tubes should be placed to relieve the pleural pressure. Tension pneumothorax needs to be treated quickly with a needle thoracostomy to release the increased pressure. In some patients, surgery needs to be performed to help prevent future pneumothorax. Surgeons will use talc powder which causes scarring and fusion of the pleura. Pulmonary embolisms (PE) are very rare in the pediatric population. One study estimated the incidence to be 0.9 per 100,000. Due to the low occurrence rate, they are often overlooked by physicians. Several factors have been linked to PEs in pediatric patients with a central venous catheter being the number one cause. Other risk factors include being overweight with a BMI >25, oral contraceptive use, and history of previous PE. In adult emergency rooms, the Wells criteria is used to aid in diagnosis, but there is no such diagnostic tool for pediatrics. It is important to recognize the signs and symptoms in pediatric patients with the most common being dyspnea and cough. 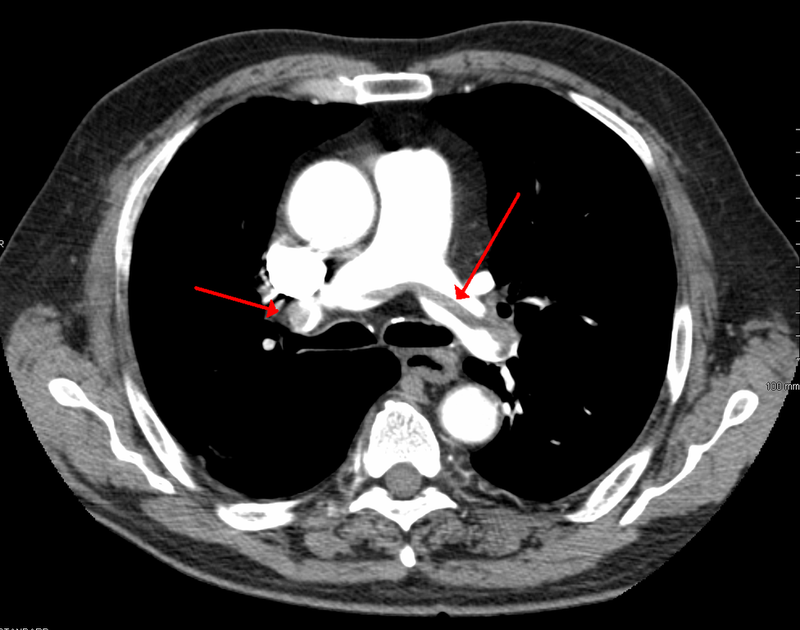 A CT-pulmonary angiogram is the most sensitive and specific scan that can be used to diagnose a PE. V/Q mismatch scans are reserved for adult patients or in cases where there is no CT scanner. Treatment is done with lysis of the thrombus, followed by long-term care with anticoagulation therapy. 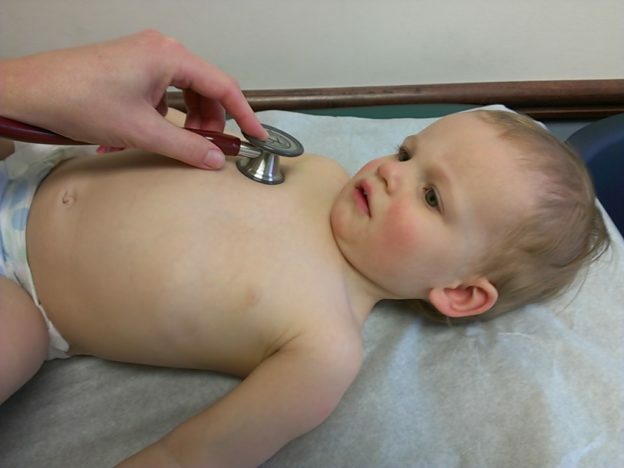 Pediatric patients present very commonly with respiratory disease secondary to infection. In pediatric patients, the causes are from virus, fungus or bacteria. Due to the broad scope of bacterial causes, this article focuses on viral and fungal causes. Bronchiolitis is an inflammatory illness that can affect patients at any age, but most commonly occurs in the pediatric population younger than 2 years. Patients present mostly in fall and winter months. It is caused by a virus that infects the small airways. The most common viral cause is rhino syncytial virus (RSV), which is a negative sense single stranded RNA (-ssRNA). Other viral causes are parainfluenzae (most common cause of croup), influenza, and metapneumovirus. Patients will present with the following signs and symptoms: fever, cough, rhinorrhea, tachypnea, wheeze, crackles, hyperresonance with percussion, and in some cases apnea. If the disease continues, patients can become cyanotic with nasal flaring and intercostal retractions. In some patients, it is common to also present with otitis media (Strep pneumoniae, Haemophilus influenzae, Moraxella catarrhalis). This should be treated with antibiotics. Bronchiolitis can lead to atypical pneumonia. The patients with the most concern are those that are younger than 6 months, males, premature, with heart or lung problems and immunodeficiency. In these severe cases, they are at the greatest risk for death due to respiratory failure. Diagnosis can be done with a chest X-ray to rule out any form of pneumonia and to see if there is hyperinflation, flattening of the diaphragm, or atelectasis. A rapid viral test for RSV can be done by testing the nasal secretions. The diagnosis is often made clinically based upon season and presentation. Severe cases may warrant blood tests for white count and to check electrolytes. Treatment is mostly done for symptomatic relief and depends upon the severity of the disease and age of the patient. Since bronchiolitis is caused by a virus, there is no definitive treatment beyond oxygen therapy. If the patient is older and healthy, simple outpatient supportive measures can be taken with fluids and nebulized albuterol. In-patient management usually follows if the patient meets the following criteria of respiratory distress, low O2 sats less than 92%, dehydration or poor caloric intake, born at less than 34 weeks of maturity or are less than 3 months old, parents who cannot handle a sick child, or an underlying disease. Prophylaxis treatment involves a monoclonal antibody palivizumab, which blocks the F protein leading to the prevention of viral infection and replication. It is given during the RSV seasons and generally for patients who are less than 2 years of age or immunocompromised. Pediatric patients who have undergone bone marrow and organ transplants are at risk for cerebral infection. Aspergillus are a group of common molds that infect children and immunocompromised adults. On light microscopy, it will show septated hyphae at 45 degree angles. There are two main categories of aspergillosis infection, non-invasive and invasive. Non-invasive occurs in immunocompetent patients who inhale spores into the lungs resulting in allergic reaction, aspergilloma, and sinusitis. Allergic bronchopulmonary aspergillosis occurs in patients who have a history of asthma or cystic fibrosis. This leads to bronchial thickening and bronchiectasis. Patients can also present with eosinophilia. 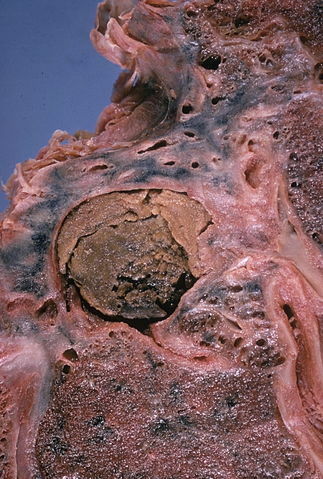 Aspergilloma occurs in patients with a history of TB exposure secondary to lung cavities. Invasive occurs in immunocompromised patients and can affect nearly any organ. Pediatric patients who have undergone bone marrow or organ transplants are at most risk for cerebral involvement which is characterized by seizures, altered mental status, and cranial nerve palsy. Diagnosis is made with fungal cultures done to test for aspergillus and their major characteristics. Treatment is done with antifungal medications such as Amphotericin B, Voriconazole, and Caspofungin. For the USMLE, it is important to learn the different antifungal medications and their mechanism of action of the fungal cells. Aspergillus can produce aflatoxins, which are known to cause hepatocellular carcinoma. Le, Tao and Bhushan, Vikas. First Aid for the USMLE Step 1 2014. New York: McGraw-Hill Education, 2014. Tao Le, Vikas Bhushan, Mae Sheikh-Ali, and Fadi Abu Shahin. First Aid for the USMLE Step 2 CS, Fourth Edition. US: McGraw-Hill Medical, 2012.